Some self-confident people may believe they are skilled multi-taskers. It is also a common saying that women are better at multi-tasking than men. Research shows that no-one is truly a multi-tasker in such a way that he or she can attend to two or more things simultaneously. Attention studies show that we are all serial–taskers. We can only attend to one thing at a time! Those who appear to be multi-taskers have instead a higher capability of switching rapidly between different focal points, whereas the rest of us (myself included) change attention at a slower pace. Attention is therefore a continuous process which jumps from one focal point to another and at a shifting pace. When you are conscious you always attend to something. Maybe you are eavesdropping the conversation at the neighbor table during lunch because you think you heard someone mention your name, or maybe you are fully focused on finding your way as you drive through an unfamiliar town. It may also be that your attention is more inward-pointed as you concentrate on solving a mathematical problem which has troubled you for days. In any case you have, by some reason, chosen your focal point. However, theoretically there are infinitely many other things you might have payed attention to, but for some reason you made your choice. Well, fortunately, it is not as unpredictable as the outcome of flipping a coin or rolling a dice, but attention appears to be a random sampling process, or what statisticians call a stochastic process, where some focal points are more likely to be chosen than others. For instance, if you are driving through an unfamiliar area, you are (hopefully) likely to pay close attention to the traffic and to signs along the road, and less likely to notice a bird flying by (well, unless you are an ornithologist, that is). But, at any split second you have to choose one thing to attend to, and one thing only, and like drawing a ball out of an urn, you sample your attention point. Attention is therefore like the outcome of statistical sampling from a probability distribution. We may call it the attention distribution. 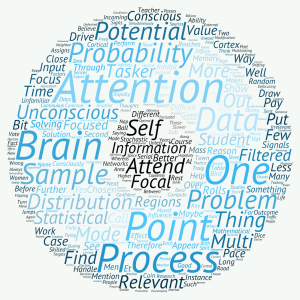 Each potential target of your attention may be selected with a certain probability. 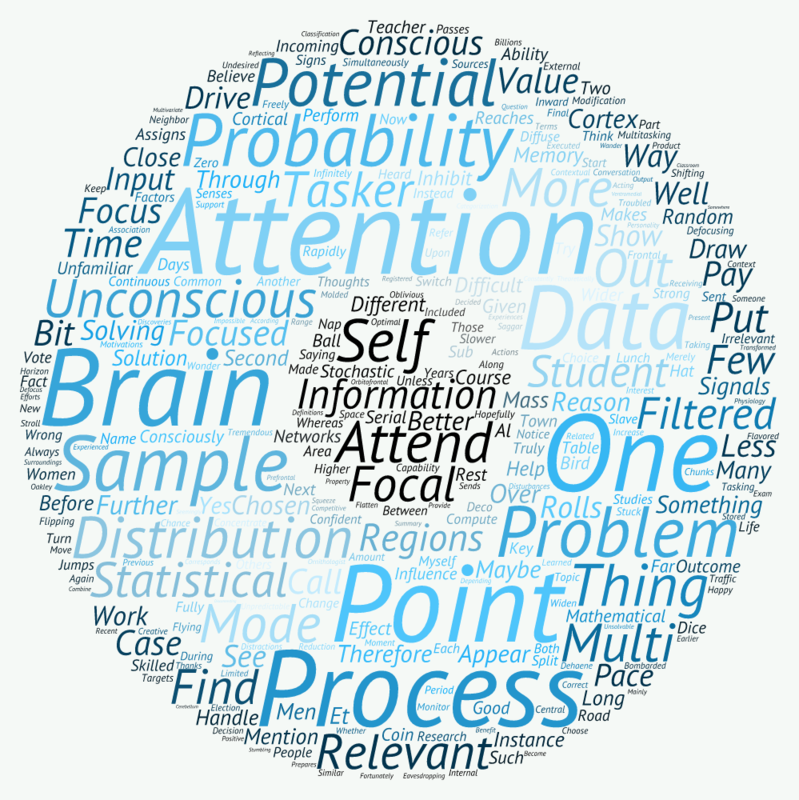 The next question is: Which factors influence this probability distribution for the potential targets of our attention? Every second you are bombarded by billions of bits of internal and external information from your senses, and your brain performs a tremendous amount of work filtering the incoming data. You should be happy for this! It would be quite impossible and very disturbing for your conscious self to handle all this information. The competitive networks (Rolls and Deco, 2010) in the cortical regions receiving input stimuli, e.g. the visual cortex, perform statistical classification, categorization and data reduction long before you are aware of it. A new study (Brascamp et al., 2015) even shows how the visual cortex makes unconscious interpretative decisions before the transformed data are sent to association networks in your (conscious) frontal cortex. On its way the information also passes sub-cortical regions where it is further modified by contextual memories of similar, previous experiences and by your motivations, values and interest. This is an unconscious process, but the data filtering is influenced by your brain physiology and your personality. The brain has learned over the years of your life what you find relevant for you, and irrelevant information is likely filtered out long before it reaches your consciousness. A further modification of the attention distribution is further executed in regions of the ventromedial cortex and the orbitofrontal cortex. These brain regions constantly monitor your actions and compute their potential values (Dehaene, 2014). Again, this is an unconscious process, and you may now start to wonder whether your conscious self has any vote in the election process of our attention, but in fact, the unconscious part of you is far better at multivariate statistical computations than your conscious self, because your working memory can only handle a few chunks of information at a time. However, you are of course not acting like a slave to your unconsciousness. If you consciously have decided to focus on something, like solving a difficult mathematical problem, your prefrontal cortex sends signals to central brain regions to inhibit undesired disturbances, and this makes a final modification to the sampling distribution of your attention. Depending on your ability to focus, this may squeeze most of the probability mass into a few potential attention points, making you almost oblivious to your surroundings. In summary we see that your brain prepares, both unconsciously and consciously, a range of potential input signals you can attend to and assigns a probability to each attention point reflecting its relevance and potential value to you. THEN, you draw your statistical sample. At that given moment you sample ONE attention point, and thanks to your statistical brain, you have most likely chosen something relevant for you in the given context. The information filtering property of the brain and the relevance/value assignment is a key reason to why it is so difficult for teachers to keep the attention from the students over a long period of time. If a student’s unconsciousness finds the incoming data as irrelevant, it is filtered out and attention is pointed somewhere else. A good teacher should therefore present the topic in a way that the student finds relevant for him or her. But the problem is of course that in a classroom with 25 students, there are also 25 different definitions of “relevant”. I mentioned earlier the effect of strong focus on the probability distribution of attention. A strong focus will through inhibition of distractions put most of the probability mass on a few potential attention points. The attention process will then move around in a rather limited output space. Oakley (2014) refers to this as the focused mode. This mode helps us put all efforts into solving difficult problems. The opposite and less focused mode, the diffuse mode, corresponds to a wider probability distribution for attention. In this case, the distribution is mainly a product of the unconscious, and attention and thoughts may wander more freely. Many enter the diffuse mode for instance when they are walking, taking a shower, listening to music or having a nap. Many have experienced the potential benefit of the diffuse mode in problem solving. Sometimes the focused mode may put zero probability on attention points which would provide the solution to the problem, and the attention process has no chance of reaching the solution. You are in fact focusing too hard! Then defocusing may flatten out the attention distribution and increase the probability of stumbling upon the solution! The positive effect of defocusing (for instance by taking a stroll, a nap or in some other way disconnecting from the problem) also appears to be related to the cerebellum, which according to recent discoveries, has the ability to combine stored memories and input signals in new and creative ways (Saggar et al, 2015). So, if you are a student, stuck with a seemingly unsolvable problem at an exam, try to defocus a bit to widen your horizon. It may help your brain to sample the correct attention point! Brascamp J. et al, (2015). Negligible fronto-parietal BOLD activity accompanying unreportable switches in bistable perception. Nature Neuroscience. Dehaene, S (2014). Deciphering how the brain codes our thoughts. Penguin. Oakley, B (2014). A mind for numbers. Tarcher, Los Angeles, CA. Saggar, M et al., (2015). Pictionary-based fMRI paradigm to study the neural correlates of spontaneous improvisation and figural creativity. Scientific Reports, 5. Previous Post: Sleep improves learning by statistical shrinkage and variable selection!